With wedding bells for Prince Harry and Meghan Markle ringing in the air in just two days, we have royal style on our minds. Breaking from tradition, the Prince is marrying an American, and that makes the event worthy of a celebration from California to the United Kingdom. From fascinators to furnishings worthy of royalty, here are three design inspirations that lend a nod to the royal event, and allow guests to celebrate in comfort and style. 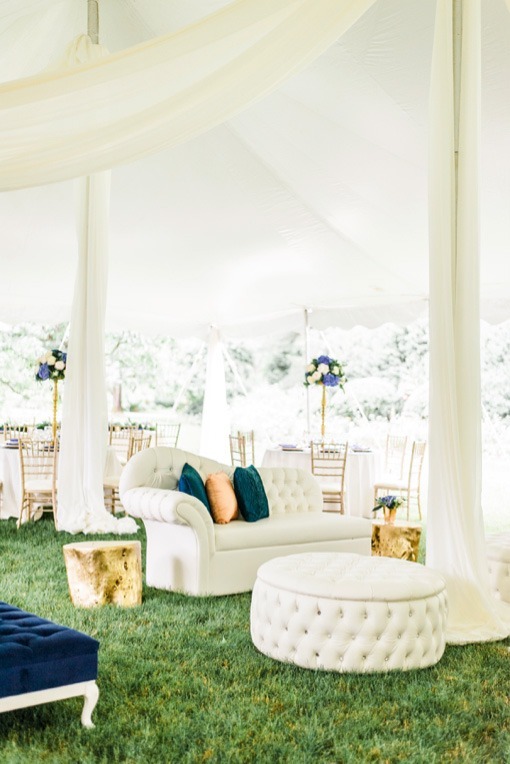 Tufted white luxurious leather and sparkling gems are the style points of the Crystal Collection featured here with a chaise and round ottoman, and accentuated by Gold Leaf Tables. A high-backed love seat and matching bar surround are also available and complete the collection. In the background, formal rounds are intermixed and draped in beautiful linen and surrounded by gold Chivari chairs for a sophisticated look. Add in florals in Meghan’s favorite pink and white peonies, white garden roses and foxgloves, and you’ll create an elegant environment that is fit for a royal wedding. A design for royal dining presides with an elegant King’s Table draped in softly shimmered champagne linen and accented with matched Dijon Chairs and small accent pillows. 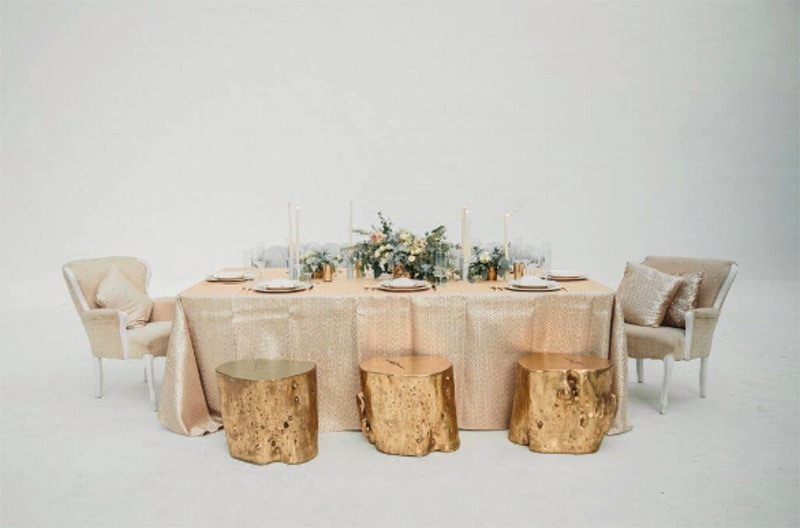 Gold Leaf Tables create an exciting alternative place to perch while adding a unique gold touch. We think that the couple who seem to be more laid back than some of their predecessors would love the modern chic of this setting. A moment respite is paramount to a happy bride. Using the understated beauty of shade and texture we created a beautifully elegant look with the Platinum 2-Piece Catalina Sectional complemented with a combination of the Brooklyn Round Cocktail Table and London Sofa Table. Pillows in a variety of texture and muted shades of gray sit perfectly with the soft pink garden rose arrangements. It’s the perfect space for a royal bride to collect her thoughts before stepping out in front of the world. Whether a fan of the traditional or bucking tradition as Prince Harry and Meghan have done, one thing is sure; the Royal Nuptials will be the social event of the year underscoring every girl’s dream that fairytales do come true. Designing a setting that commemorates the happy occasion is a great start to the perfect celebration.